We were pleased to welcome BB Leaders from New Zealand during November. 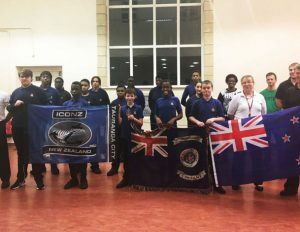 The Leaders including National President, Richard Harkness and members of the BBNZ staff team came to join in commemorations for the end of World War 1 and also to share with us more about their Iconz adventure programme. During their time in the UK they had the opportunity to visit some BB Companies including 3rd Hemel Hempstead and 133rd London Company based in Tottenham, which provided our visitors with an insight into Company programmes here in the UK. The group also ran a presentation at BBHQ for those that wanted to hear more about the Iconz programme which was launched in New Zealand 18 years ago. The five Leaders also joined with young people and Leaders from across the Brigade at the National Service of Remembrance at the Cenotaph in London. Find out more about BB New Zealand and Iconz at bb.org.nz.